and Dr. Richard Cracroft for the following special feature. There was such magic in that name, SLADE! Day or night, now, I stood always ready to drop any subject in hand, to listen to something new about Slade and his ghastly exploits. Even before we got to Overland City, we had begun to hear about Slade and his "division" (for he was a "division-agent") on the Overland; and from the hour we had left Overland City we had heard drivers and conductors talk about only three things -- "Californy," the Nevada silver mines, and this desperado Slade. And a deal the most of the talk was about Slade. We had gradually come to have a realizing sense of the fact that Slade was a man whose heart and hands and soul were steeped in the blood of offenders against his dignity; a man who awfully avenged all injuries, affront, insults or slights, of whatever kind -- on the spot if he could, years afterward if lack of earlier opportunity compelled it; a man whose hate tortured him day and night till vengeance appeased it -- and not an ordinary vengeance either, but his enemy's absolute death -- nothing less; a man whose face would light up with a terrible joy when he surprised a foe and had him at a disadvantage. A high and efficient servant of the Overland, an outlaw among outlaws and yet their relentless scourge, Slade was at once the most bloody, the most dangerous and the most valuable citizen that inhabited the savage fastnesses of the mountains. In chapters 10 and 11 of Roughing It (1872), Mark Twain recounts and then puzzles over the cowardly death of desperado "Jack" Slade. Hanged by the exasperated Vigilantes of Virginia City, Montana (Idaho Territory) on March 19, 1864, the condemned Slade's "tears, prayers and lamentations," coming from a man "credited" with killing twenty-six people, posed, writes Twain, "a conundrum worth investigating" (Roughing It, p. 75).1 Slade's strange history highlighted for Twain yet another of the ironic incongruities between inflated, romantic expectations and shrunken realities which formed the core of his world-view and shaped his brand of humor. 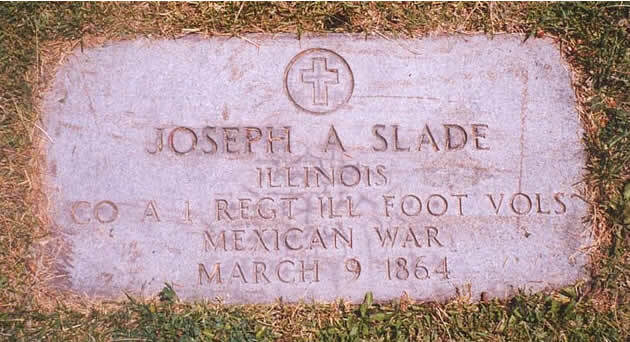 Slade's grieving widow, Virginia, who futilely rode twelve miles at breakneck speed to come too late to his rescue (she'd done it before), promptly moved to Salt Lake City, apparently leaving the body, which she had preserved in raw alcohol in a metal coffin, sitting uncalled-for, for several months in the railroad freight depot at Ogden, Utah Territory. Officials, upon receiving no burial instructions from Virginia, eventually shipped Jack's remains to Salt Lake City, where he was interred in pauper's field on July 20, 1864. Slade's grave is located in the southwest corner of Plat B4, between cemetery streets Main and Center, and Fifth and Grand. The plot lies about fifty yards northeast of the Sexton's Office. The grave is one of the few marked graves in Plat B4, where it lies amidst a large, well-manicured grassy acre. This lonely marker, honoring an American veteran (born in 1821, at Carlyle, Illinois), is also a tribute to the to the literary pro-activism of the late Dr. Don D. Walker (1918-2000). In 1958, Walker obtained the headstone and, with students from his American Literature course, and with proper decorum, cemented the stone in place. Walker, Professor of English and American Studies and noted Western American literature scholar at the University of Utah, was intrigued by a conundrum less philosophical than Twain's: the whereabouts of Slade's body, which was last heard of lying, pickled, in an Ogden depot. Walker traced Virginia Slade's trail to Salt Lake City, where she lived briefly until her remarriage a year later, in March 1865, and her eventual move to Denver and Chicago.2 On a hunch, Walker went to the Salt Lake City Cemetery, just a few blocks from his home; there, with the help of the sexton's records, he found Slade's forgotten and unmarked grave. Walker wrote to the Department of the Army pointing out that a veteran of the Mexican War was lying unheralded in a Salt Lake City graveyard. Six weeks later a chiseled granite military headstone arrived at Walker's home. 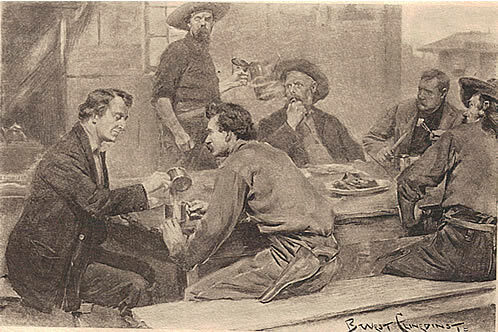 With sufficient ready-mixed cement, a half-dozen students, and a copy of Roughing It in hand, Walker and the assembled faux-mourners set the stone in place, accompanied by the reading of pertinent passages from Mark Twain eulogizing the late desperado's several virtues, and recalling Sir Richard Burton's observation (made at about the same time as Twain's western trip) that Slade was "the most gentlemanly, quiet and effective officer on the Overland Service" (Chapman, 192). The little band of literate mourners left Jack Slade's less savory deeds-at least twenty-six of them-unsung! 2. For an account of the saga of Jack and Virginia Slade, see Arthur Chapman, The Pony Express: The Record of a Romantic Adventure in Business (New York: G.P. Putnam's Sons, 1952); Dabney Otis Coffins, Great Western Rides (Denver: Sage Books, 1961); Waddell F. Smith, The Story of the Pony Express (San Francisco: Hesperean House, 1960).